Creating the perfect aquarium doesn’t have to be difficult. While there are many factors to consider when designing an aquarium, you can easily get the tank you want by researching ahead of time. Starting with a small tank doesn’t necessarily mean cheaper or easier. Use this guide to learn more about important things to consider when buying an aquarium, including potential tank mates, sizes, and water conditions. You’ll be surprised just how versatile and diverse aquariums really are! Before you make a purchase, you need to understand just how much work goes into maintaining an aquarium. It isn’t a matter of just feeding the fish and walking away. You need to closely monitor the behavior of the fish, ensure proper lighting and filtration, maintain water quality and take care of any issues that could threaten the inhabitants of the tank. Don’t let this defer you from the aquarium hobby all together, there are several easy-to-maintain setups available; you just need to research before you buy. Freshwater – offers the lowest maintenance and affordable fish. Small tanks are easy to start, making them ideal for beginners. A variety of fish are available to help you create a colorful aquascape that is easy to control. Brackish – a combination of fresh and saltwater. Saltwater – requires extensive maintenance, but offers unparalleled results. Small tanks can be limiting, but are very rewarding. Do not choose a saltwater tank for your first aquarium. While some fish and invertebrates can tolerate both fresh and salt water, they usually do have a preference. If you are set on catering your aquarium towards one species of fish, you’ll be able to easily establish a tank with the perfect water conditions. Those hoping to build a thriving community of colorful undersea life will need to ensure all the inhabitants can tolerate the same water conditions. Aside from choosing between fresh and salt water, consider tankmates that share the same preferences to pH and nitrate levels. There are several factors a person needs to consider when selecting a new aquarium. While cost is often the deciding factor, people need to consider the cost of upkeep. Large aquariums, for example, often require larger filters and extensive routine cleanings. If you are building a bustling community tank, a large aquarium may also be more expensive to populate. Is My Aquarium Big Enough? 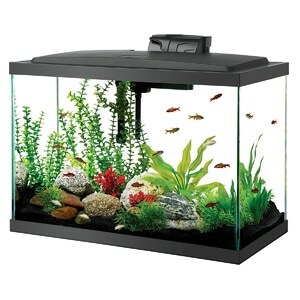 While getting an affordable aquarium is important, you also need to ensure the tank is suitable for the inhabitants. Your parents may have told you that fish only grow to the size of their surroundings, but this is only a half truth. Fish that don’t have room to grow tend to die at very young ages. Goldfish, for example, can grow over a foot long and live for up to 10 years in captivity. To determine if your fish tank is big enough, research the potential habitants. If their behavior doesn’t dictate otherwise, the general rule of thumb is one inch of fish per gallon. This doesn’t mean add ten 1-inch baby Oscars to your 10-gallon tank; you need to use the measurements of the average adult fish. If you are a beginner, a 10-gallon tank is the perfect starting point. Some of the most beautiful tanks in the world are small. With careful planning, you can create a gorgeous 10-gallon aquarium that makes even advanced hobbyists jealous. 10-gallon tanks are perfect for people who are just starting with the hobby. They often have a low price point and fit easily into small spaces. While the size significantly restricts the amount of fish you can add, this shouldn’t defer you from investing in a 10 gallon. Freshwater – one betta, five harlequin rasboras or ember tetras, two otocinclus catfish. Freshwater tanks are much easier to stock than saltwater at this level. Most saltwater fish found in stores prefer a mix of open spaces and extensive rockwork to explore. This means it is difficult to fit more than three or four fish in the tank. This makes freshwater much more appealing to people who want to see a lively collection of fish. Half-moon aquariums are a great choice for areas with limited space. The unique shape helps maximize viewing space and create an unobstructed view of the fish. 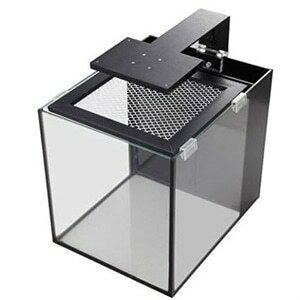 This makes the tank ideal for small, colorful fish like neon tetras, rosaboras, or guppies. There are plenty of fish that would be thrilled to live in this aquarium. Just add gravel, decorations, and plants! While this tank boasts an affordable price tag, it comes with everything you need to start keeping fish. The 50-watt heater and small LED light are great for fresh and brackish fish. An easy-to-use cartridge filtration system makes ongoing maintenance a breeze. It’s wise to stock up on a few extra cartridges when you purchase the kit, as you will need to replace the small premade cartridges about once per month. While some live plants may not appreciate the small light, it is enough to brighten the tank and make it the center of attention. If you don’t want to substitute plastic plants, try investing in some java fern. It can tolerate low light and is one of the easiest plants to grow. Much like the rest of the tank, it requires very low maintenance to keep it looking its best. Because of its practical features, the Tetra Half Moon Aquarium Kit is the ideal choice for beginners. The kit itself doesn’t come with very many instructions, so you will need to do some research before adding fish. However, its unique shape makes it perfect for almost any small, colorful fish. Starting with a high-quality tank can be an adventure. With the Innovative Marine Nuvo Fusion Premium Starter Kit, you are in complete control over your freshwater tank. 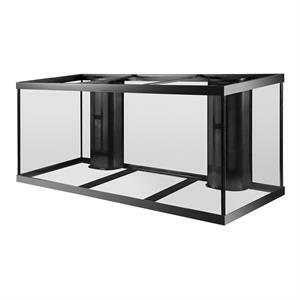 The sleek minimalist style makes it perfect for those looking for an aquarium that truly stands out. Because of its rectangular shape and stylish features, this tank is perfect for centerpiece fish like bettas, gouramis, or killifish. If you would prefer a thriving community, try adding a large piece of driftwood or a circular rock structure in the center. This fish tank offers high-end features, making it an attractive choice for hobbyists that want to get everything they need in a single kit. One of the kits most attractive features is the filtration system. The hidden filter extends across the back, saving space and reducing noise. A powerful LED light creates a beautiful array of colors. While the 18-watt light is designed for reef aquariums, it is suitable for almost any freshwater fish. The alternating color pattern is specifically designed to stimulate coral growth, but it looks lovely on its own. If you decide to change to a saltwater aquarium later on, you will be prepared. While the Innovative Marine Nuvo Fusion Nano 10-gallon tank is designed for saltwater enthusiasts, freshwater hobbyists can appreciate the design and quality of the tank. While freshwater plants may not appreciate the lighting, it can bring out some of the natural colors in your fish. This versatile tank is an excellent choice for those looking for an upgrade. While the Marina LED Aquarium Kit appears basic, it has everything you need to dive into the world of freshwater aquariums. 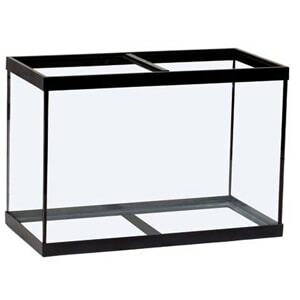 Three different sizes allow you to find a rectangular aquarium that fits the area you have available. Because the tank measures 20 by 10 inches, you have plenty of room to decorate the tank how you see fit. This makes it one of the most flexible out of all the tanks chosen for this section. Create a bustling community with thriving live plants or make a suitable home for your gourami or betta. A long-lasting LED hood lamp mimics natural daylight, making it a great choice for growing leafy plants. Create an exotic environment with green tiger lotus, anubias, or amazon swards. The brighter light is suitable for almost any kind of freshwater fish. Filtration is also important. Marina is known for producing affordable, yet powerful filters with easy-to-change cartridges. The S15 clip-on filter uses a very slim carbon plus ceramic cartridge that effectively removes ammonia from the water. While the unique design features Ceramitek, it still needs to be changed regularly. Luckily, these filter cartridges are fairly inexpensive and are perfect for tropical fish. 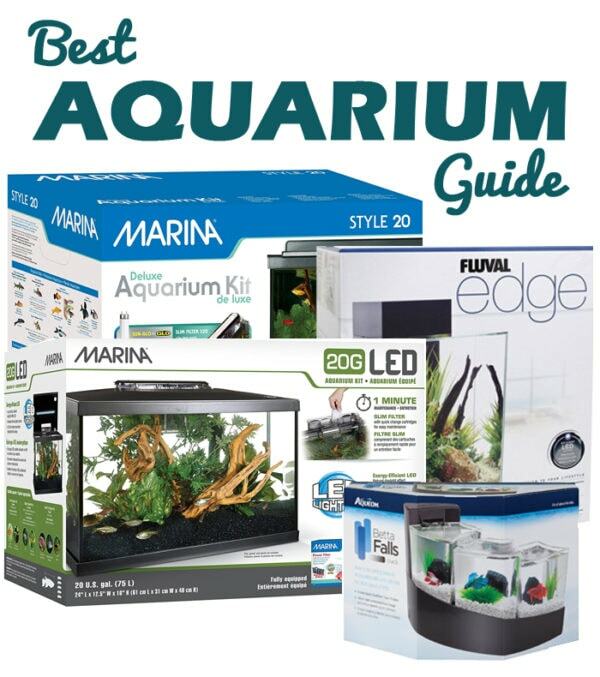 The aquarium kit includes everything you need to get started, including guide book. . Aside from a slim clip-on filter and daylight LED lamp, the kit includes Fluval Max fish food, Aqua Plus water conditioner, Cycle Biological Supplement, a net, and a care guide. You’ll be able to start cycling the tank the day it arrives! 20-gallon aquariums are a nice step up from 10-gallons. They don’t take up much more shelf space, but the taller, larger dimensions help you create a more bustling community. You can double the amount of tiny fish you have from your old 10-gallon aquarium or you can create something completely new. Feel free to mix and match the species mentioned above. They are all schooling fish, aside from the rainbow shark. While the tiger barbs can be somewhat aggressive, any of the other fish on the list will get along. A 20-gallon fish tank gives you the perfect amount of space to create the look you want. The Tetra 20-gallon aquarium kit is perfectly tailored to beginners. Choose from one of three complete kits: Color Fusion, GloFish, or Tetra. 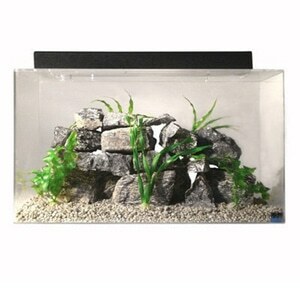 Each version has its benefits and includes everything you need to start a well-themed aquarium. Each fish tank includes a picture of the ideal aquascape complete with fish. The Color Fusion aquarium kit includes a color-changing LED light and beautiful teal, white, and blue plants. In the picture, you’ll see the natural orange and yellow tones of platies popping against the cool blue colors. This creates an exotic look. The GloFish Kit is a wonderful way to create a vivid, tropical look in almost any room. Rich shades of pink, yellow, purple and green glow in the dark. Use the special LED hood to highlight the neon colors of your GloFish. The fluorescent décor adds just the right amount of light to a dark room. While the GloFish and Color Fusion kits are designed to create colorful aquariums, the Tetra aquarium takes a more natural approach. Four natural-looking artificial plants are included in the kit, along with an artificial Boxwood plant mat and a bright LED light. This setup is a smart choice for community tanks. 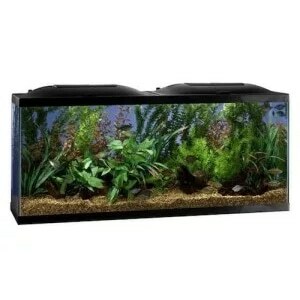 As one can guess, these tank kits are ideal for people looking for a low maintenance aquarium for their home. The included lights are not ideal for live plants, but the durable artificial plants look amazing. Each tank includes a quality mini UL heater and Whisper 20 filter, making it an affordable way to get quality supplies. Many advanced hobbyists are weary of aquarium kits because they don’t want to limit themselves. The Aqueon 20 Gallon Starter Kit is the perfect solution, offering everything you need to start cycling the tank. A straight-forward design allows you to easily access the Quiet Flow 10 LED Pro Filter. The kit also includes a 100W preset heater, thermometer, net, water conditioner, and fish food. One of the best features of this aquarium is the low-profile LED full hood. This bright light makes it easy to grow a wide range of popular aquarium plants. Try getting an Aquatic Arts Plant Package to take some of the guesswork out of plant shopping. The spacious tank can easily grow java fern, moneywort, anubias and more. 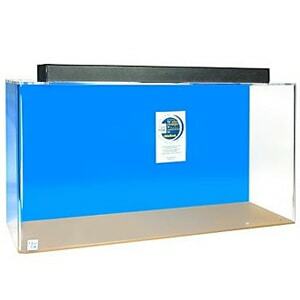 The Aqueon aquarium kit is an ideal first tank because it comes with a simple startup guide. 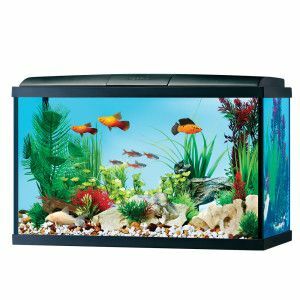 Because it includes bright lighting, a powerful filter, and a rectangular design, new hobbyists will have the freedom to put almost anything they want in this convenient tank. All you need is fish! The SeaClear acrylic aquarium combo set is the ideal choice for the advanced hobbyist who doesn’t want any of the bells and whistles. It’s a simple tank, but the strong acrylic materials make it worth the value. Acrylic aquariums promote a crystal-clear view of your fish. The added durability also means reduced chips and cracks. This means your aquarium will last much longer than a glass counterpart. Using clearer materials helps make keeping fish more enjoyable. Colors are vivid and pop, especially when up against a rich background. To create the most visually-appealing display, use black substrate and bright green plants like Myrio or Banana Plants. The, stock the aquarium with white clouds, black tetras, or serpae tetras to add some contrasting colors. Whether you want to recreate the wild colors you saw at the pet store or you want to build a practical display, SeaClear can help you bring the beauty of the ocean into your own home. While SeaClear doesn’t divulge too much information about the included 15-inch electrical light fixture, hobbyists will have some flexibility when it comes to selecting a bulb. If you aren’t sure how effective the bulb or fixture will be, try starting with easy-to-grow plants like Amazon Swords. If you are looking for a versatile 20-gallon aquarium that can easily switch from fresh to saltwater, the SeaClear should be an obvious choice. Choose from black, cobalt blue, or a clear finish to give your new home a seamless look. Stocking a 55-gallon aquarium can be an interesting experience. You can choose to further expand your community by mixing livebearers, tetras, danios, and other familiar species. This tank size also invites several unusual species of fish, such as dwarf puffers and African butterfly fish. 55-gallon fish tanks are an excellent choice for living rooms and other larger spaces of the home. They require slightly more maintenance than 10 or 20-gallon tanks, but they offer far more options in terms of plants and fish. Marineland is easily one of the biggest names in the aquarium hobby. They are known for creating affordable, yet powerful equipment that lasts for years. It only makes sense that their aquarium kits would have the same integrity and ingenuity. With a budget-friendly price tag and everything you need to start an aquarium, it is easy to see why the Marineland models are so popular. Part of building the perfect aquarium is knowing where to invest when making upgrades. Because this kit includes a super-powerful 200-watt submersible heater, a cartridge filter and fluorescent lighting, you won’t need to make as many updates later. You’ll have everything you need right from the start. One of the best features on this 55-gallon glass aquarium is the hood. A newly updated design includes optional blue lighting to help stimulate plant growth. Instead of investing in large plants, try selecting plants that will easily spread across the tank, such as wisteria. While it may take a while for the plants to root and spread, allowing them to do so will help save you money. The aquarium itself is made of glass, so it can easily be converted to saltwater if you prefer. 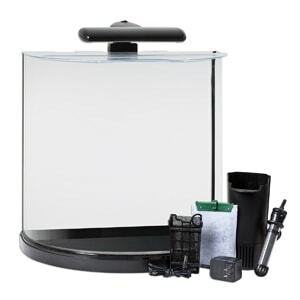 For beginners, this kit is the ideal freshwater tank. Build a large environment for your favorite fish or create a bustling community. You’ll be surprised by just how easy setup can be when you own a high-quality aquarium like the Marineland Biowheel Aquarium. This unique kit is available in multiple sizes, with the 55-gallon being the largest. Aqua Culture is another major producer of aquariums, but it has a noticeably cheaper cost than competitor Marineland. This makes it more attractive for new hobbyists who may not be concerned with quality right away. While the kit is very durable and includes everything you need to create a stunning environment for your fish, you will likely find yourself putting more money into the tank later on. For example, if you are planning on building a thriving community of fish, the small internal Tetra filter might not cut it. If you don’t want to invest in an upgraded filter or better aquarium lighting, you will have to be very careful how you stock the tank. The example shown on the box is actually fairly accurate: 14 platies. Small live bearers, such as platies or guppies, don’t require health filtration to thrive. Small leafy plants like micro sword, myrio or wisteria provides plenty of cover for baby fish. They will also be able to slowly grow with the included energy-efficient LED light. New hobbyists who want to sway away from livebearers may want to consider creating a few schools of fish. The tank is big enough, for example, to easily fit 10 black phantom tetras and 10 neon tetras. It all comes down to personal choice. 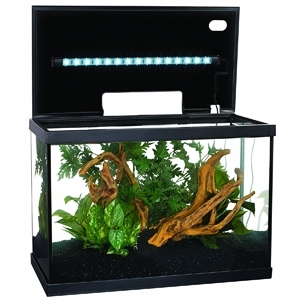 The Aqua Culture aquarium kit includes a low-profile hood lamp, an internal filter with cartridges, food samples, and information on starting a new tank. The goal is to keep each fish living long, happy lives while getting the most bang for your buck. Are you trying to create a gorgeous single-specimen or species tank? 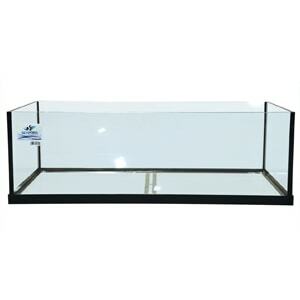 The Acrylic Rectangle Aquarium Sapphire offers the high-quality, crystal clear viewing. Acrylic is known for being “clear for life;” it is scratch-resistant, doesn’t fade or get cloudy. This luxurious aquarium is designed with the serious hobbyist in mind, offering the finest cell cast acrylic and a lifetime warranty. While most of the aquariums mentioned in this article include everything, this classic aquarium is tank only. You will need to purchase a filter, heater, and light; however, if you are building a species or single-specimen tank, you can use this opportunity to cater these to the needs of the fish. For example, if you want to stock your tank with several large goldfish, you can invest in a more powerful filter and ditch the heater. If you want to create a thick forest of plants for your large parrot fish or angel fish to explore, you can invest in the powerful LED light you need. Try using the gorgeous, clear tank to emphasize colors found in freshwater fish like African Cichlids. Hobbyists can easily add natural brown rockwork to make bright colors pop even more. The clear black blue sapphire acrylic will make everything in the tank seem brighter and lighter. Like many other tank-only selections, this large rectangular tank can be used to create freshwater, brackish, saltwater, or reef environments. If you are new to the hobby but want to invest in a quality tank that will last a lifetime, this is a fantastic opportunity. 75-gallon aquariums are the ideal choice for hobbyists, as they allow you to keep much larger fish. Interesting, colorful fish like discus and larger African cichlids thrive in 75-gallon tanks. At this size, you can also keep several schools of fish, allowing you to create a very colorful community tank. The biggest deciding factor is going to be how much space you have available. Keep in mind that you will most likely need a special stand to go with your new tank. While a 75-gallon is a much bigger investment, the results of a well-stocked tank can be amazing. Seapora is hardly new to the aquarium scene. While the name may sound familiar to hobbyists, the high-quality manufacturer isn’t normally found in stores. Every aquarium they produce offers unique proportions, allowing hobbyists to truly get creative when it comes to keeping live fish. The Seapora 56218 Edge Series Aquarium measures 21 by 3.5 by 5 inches, making it very shallow when compared to other 75-gallon tanks. The high-quality glass tank offers a sleek, rimless appearance to optimize viewing. While the short aquarium is designed for reef set-ups, many tropical fish owners are using the extra-wide aquariums to create riverways. Instead of adding a large centerpiece, hobbyists are adding rich rockwork and natural-looking plants to bring a part of nature into their home. After sparingly planting colorful plants like ludwigia and cryptocorne, they add schools of tetras to their peaceful river community. Shorter, wider tanks are also a smart choice for piranha, which lurk in shallow or deep waters. The biggest con of investing in the large 75-gallon tank is that the price only includes the glass tank. You will be responsible for purchasing a lid, heater, filter, lighting, décor and other supplies. This makes the Sephora Edge a great choice for anyone who wants to take their aquarium hobby to the next level. Perfecto Manufacturing is known for producing simple, yet durable glass aquariums. The 48 by 18 by 21-inch aquarium offers a more traditional shape, especially when compared to the Seapora Edge. This makes it easier to incorporate into home décor. 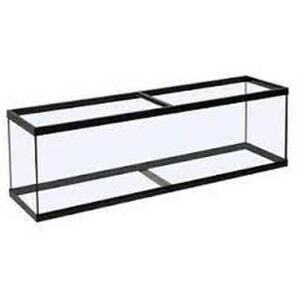 Most aquarium stands designed to support 75-gallon tanks will easily fit this rectangular aquarium. The other big advantage it has over the Seapora Edge is the price. While the viewing quality isn’t quite the same, the cheaper price tag makes this aquarium a very practical choice. Because the tank is fairly tall, it is a great choice for building rockwork for African cichlids. If you don’t want to build a wall or large centerpiece, try using the tank for colorful discus. If you choose to grow plants, you will need to make selections that can grow tall quickly or can tolerate low light. This is because even the most powerful lights will have trouble reaching to the depths of the tank. Sword Amazons are an excellent choice, and bushy African Water Ferns are a close second. Much like the Seapora Edge, hobbyists who purchase this aquarium will be on their own when it comes to selecting equipment. Nothing is included with the heavy glass aquarium. You will need to carefully plan your aquarium and identify the needs of the fish you want to keep before deciding. Consider a powerful, professional light like the Current USA Satellite Plus Pro LED to help make sure every corner of the tank is covered. A 125-gallon tank comes with a lot of responsibilities, but it is the most flexible in terms of stocking. Almost all fish you find at a local pet store can be kept in a 125 gallon aquarium, even large species like oscars or severum. Advanced hobbyists will appreciate the versatility of a 125 gallon tank, whether they are keeping a single specimen or a community with hundreds of fish. A person needs to be dedicated to keep a 125 gallon aquarium looking its best. If you are going to choose such a large tank, you need to be prepared to invest in the right equipment and have the time to maintain it. For example, if you are planning on growing plants, you will need a more powerful light to reach the depths of aquarium. While this is much more work compared to a 10 gallon starter aquarium, the benefits are far more rewarding. If you are planning on shopping online for 125-gallon aquariums, you need to keep in mind that these specialty tanks will weigh a lot. You will need to be prepared to move the bulky, 200-pound tank upon arrival. You will also need to invest in a special stand, as these heavy aquariums are too big for a standard shelf or desk. The Aqueon Tank from the All-Glass Aquarium Company is designed with filtration in mind. Included in the large glass tank is a special Mega Flow Overflow System. This unique design works to keep your aquarium consistently clean and offers a flow through rate of 600 gallons per hour. The filter gathers water from the bottom, middle, and top of the tank. Water is filtered out and spills over the inner wall and into the reservoir. While this filtration system is what sets the Aqueon Tank apart from others in its size range, it can also be its downfall. Some fish don’t require such a powerful filtration system. For example, a guppy may not appreciate the forceful current. Larger fish, however, will love the cleaner space. Limited product availability makes this 125-gallon aquarium a rare find. The powerful filtration system is well-worth it for those trying house large fish. It’s no secret that filtration is incredibly important to modern aquariums. Not only does the Perfecto Marineland aquarium offer a flow rate of up to 700 gallons per hour, it works to keep the system well-hidden. The 2-corner units help draw attention away from the busy filters, instead guiding the eye more towards the middle of the tank. Each filter is partially removable, making the large aquarium a breeze to clean. 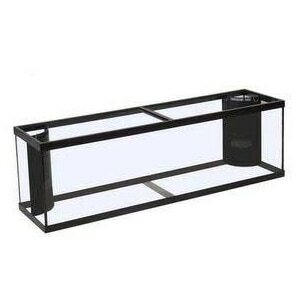 The rectangular fish tank measures 72 by 18 by 22-inches, making it perfect for almost any freshwater fish. While you could stock this tank with over 60 small neon tetras, the large space should be an invitation to get creative. Explore oddities like pufferfish, eels, oscars and more with the Perfecto Maineland Aquarium. All good things must come at a price. While Perfecto Manufacturing aquariums tend to be affordably priced, the powerful filtration adds a lot to the overall cost of ownership. Minimal noise and increased circulation is often enough to convince advanced hobbyists to take a long look at this model. Are you a hobbyist ready to take their passion for aquascaping to the next level? This 125-gallon tank is a simplistic model that inspires a lot of creativity. The basic model encourages hobbyists to select their own equipment, such as hang-on or canister filters. Made from a unique distortion-free glass, this basic aquarium can last years without leaks, scratches, or dings. Because of its massive size, hobbyists do not have to feel limited when selecting fish or décor. Almost any species of tropical fish can be happy in this 72 by 18 by 22-inch aquarium. This makes it a terrific addition to a long hallway or bare wall in a home. Select long fish, such as dragonfish, to captivate other people’s attention. 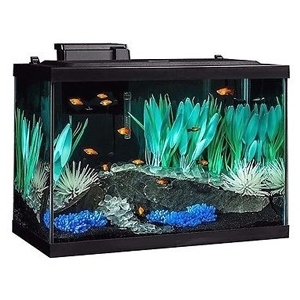 As one can tell from the lower price point, this is a good middle-of-the-road aquarium for hobbyists who are ready to make the upgrade, but don’t necessarily want to spend a lot of money. If you already have supplies at home, you can start cycling this huge aquarium the moment it arrives. Simply add a powerful cartridge filter, heater, and light to get the perfect look. After reading dozens of aquarium reviews, it can still be difficult to try and make a selection. For most people, it comes down to choosing between a kit and a basic aquarium. For those who want to purchase everything in one click, research different kits to identify the ones that are best for you. If you are hoping to have a little more control over the equipment being used, go with a basic model that meets the size requirements of the project. You can always add features later and have the opportunity to get the best deals using this method. Before you buy, take out a pen and paper. Write down everything you want to happen with your current or future hobby. This will help you gain focus and select equipment that will work well for your set up. If you aren’t sure where to start, research a few different tropical fish profiles and write down anything that sounds like it would be fun to keep. Then, ask customer support or forums to help you build the perfect aquarium from the ground up. Aquarium selection can be a complicated process, but you don’t have to go it alone. Our helpful guides are always a good reference or starting point. To learn more, please contact us today. Acrylic Aquarium: Best Tank for You? Please don’t advise combining dwarf puffers with other fish as you do with a 55 gallon tank. Puffers armed with a bark or teeth will kill other fish.